The reviews are in and the Samsung Galaxy Tab one-panel slate is a hit, mostly. Reviewers don't appear to be bothered by the Galaxy Tab's diminutive size compared to the iPad, no matter what Apple CEO Steve Jobs says. And most see the Galaxy Tab as a credible competitor to the iPad. Will the Galaxy Tab win over your heart? Will Samsung sell one million Galaxy Tabs before the end of the year, or will the electronics maker be forced to come out with a 10-inch Galaxy Tab in the near future? Read on, to see what the critics are saying -- including Wired's Christopher Null , Harry McCracken writing for Time , The New York Times' David Pogue, The Wall Street Journal's Walt Mossberg, Gizmodo's Matt Buchanan, and, of course, PC World's own Melissa J. Perenson -- about the Samsung Galaxy Tab. The critics can't agree on whether the Galaxy Tab's 7-inch screen size is big enough compared to what you get on the 9.6-inch screen. Most, however, say the screen is better than you would expect. Writing for Time magazine, McCracken said the Galaxy Tab's "display is impressive ... with a higher dots-per-inch count than the iPad ... even though the resolution is lower." Null agreed with McCracken, saying the Samsung tablet's "1024 x 600-pixel resolution makes this less of a big deal than you might expect." 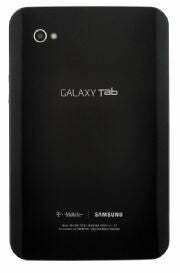 Several critics also noted that the Galaxy Tab's screen was not as bright as the iPad's. But two reviewers weren't pleased with the Galaxy Tab's display. Buchanan said the tablet's screen wasn't big enough, while Mossberg echoed an argument made by Apple CEO Steve Jobs in October. "The Tab has a 7-inch screen versus the 9.7-inch display on the iPad ... but the numbers are deceptive ... the actual screen real estate on the Tab is less than half of the iPad's." Multitasking, Camera and Flash, Oh My! All of the critics were quick to point out that the Galaxy Tab has a few advantages over the current state of the iPad. 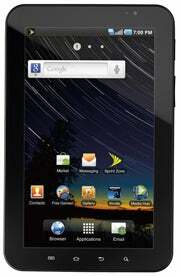 Namely, the Galaxy Tab has front- and rear-facing cameras, Adobe Flash for viewing online video and multitasking. (The iPad will get multitasking later this month with the iOS 4.2 update.) But these added features aren't all they're cracked up to be, according to the critics. The first thing to note is that taking photos with a giant slab of technology is not as subtle as taking a snap with your smartphone. "The big viewfinder (otherwise known as the screen) was a kick, but no way are you going to be subtle when taking a photo with the Galaxy Tab," Perenson said. The other thing is that the cameras may not be that great. The Galaxy Tab uses a 3.2 megapixel rear-facing camera, but Mossberg said it delivered only "average quality," while Null said it was "fair-enough." Video calling doesn't appear to be that great either, and some experienced problems with Qik, the Galaxy Tab's third-party video calling app. Mossberg said he experienced dropped calls and at one point lost all audio on the call, while Pogue called the whole video calling experience "flaky." Qik is reportedly working on a fix for the app. Perhaps the most telling comment came from McCracken who said Apple's "FaceTime video-calling software [was] sorely missed" on the Galaxy Tab. Another near-universal comment was the Galaxy Tab's considerably slower browser speeds compared to the iPad. Null said Web pages "loaded more slowly than the iPad - sometimes taking twice as long." Mossberg said the browser was a bit "jerky in zooming into text and scrolling through long pages." Gizmodo's Buchanan, who generally hated the Galaxy Tab, was heavy on the spite, saying the browser was "miserable, at least when Flash is enabled. It goes catatonic, scrolling is laggy, and it can get laughably bad." McCracken disagreed, however, saying the browser "stacks up well against the iPad's, and can play the Adobe Flash videos that remain banned from Apple devices." Then again, both Pogue and Mossberg said that playing Flash video was a little hit and miss; sometimes the videos worked, sometimes they didn't. Aside from a few apps that Samsung redesigned for the Galaxy Tabs screen size such as e-mail, calendar and contacts, most reviewers found that Android apps originally designed for smartphones didn't scale that well. Just like with the iPad, the Galaxy Tab can use almost any Android app, and just blows it up to account for the bigger screen. "Some of my downloaded apps scaled fine to tablet size. Others were surrounded by large black bars," Mossberg said. While Pogue disagreed saying Samsung's tablet either "blows them up, at the expense of clarity, or lets them float in the center of the larger screen with a Texas-size black border." One problem the reviewers pointed to was also the Galaxy Tab's price. Unlike the iPad, you have to purchase the Galaxy Tab through the four major cellular carriers including AT&T, Sprint, T-Mobile and Verizon -- US Cellular is also selling the Galaxy Tab in some markets. Two carriers -- Sprint and T-Mobile -- offer a contract-free version, but if you want a cheaper upfront cost for the device, you have to make a two-year commitment. The iPad, by comparison, offers a Wi-Fi only version and the 3G models are contract free. Despite some of the complaints, almost all of the reviewers said the Galaxy Tab was a good device and a workable alternative to the iPad. Just make sure you think about the Galaxy Tab's cost and maybe try it out for yourself before buying.